This hit show uses the athleticism of rock-ballet en pointe in a high-impact production that has entertained thousands of people of all ages. It is packed with innovative and original choreography and powerful performances from the strong cast of dancers. Queen at the Ballet captures the story of the great pretender, Freddie Mercury, told through the medium of dance. Set to over 20 of his greatest hits (including 'Who wants to live forever', 'Another one bites the dust', 'Barcelona' and many more), viewers are taken on a journey through the fascinating life of one of the world's greatest singers. Michael Hankinson's exquisite, recorded orchestral arrangements of Queen's music are further enhanced by the live gymnastic vocals of Johannesburg's renowned rocker Cito (WONDERboom & Jesus Christ Superstar fame), Daniel Fisher (Fiddler on the Roof) and Magdalene Minnaar (Phantom of the Opera). Private Presley - a Salute to the King, features over 30 of Elvis Presley's hit songs including Love Me Tender, Jailhouse Rock, Blue Suede Shoes, A little less Conversation, Hound Dog and many more foot stomping, unforgettable hits. The show follows the gigantic rise of one of Rock ‘n Roll’s greatest legends. 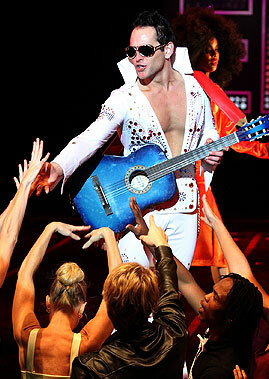 Set to some of his most famous songs, Private Presley portrays memorable and key moments from his jam-packed life. You can look forward to a kaleidoscope of timeless classics set to hip-swaying choreography, and you'll leave the theatre with nostalgic memories and a smile on your face after having been thoroughly entertained by Bovim Ballet, and lets not forget, Elvis Presley. "Surpassed every expectation I had." "Queen rules at the ballet!" "Treat fot for a King"
"The show is a hit....gripping performance."